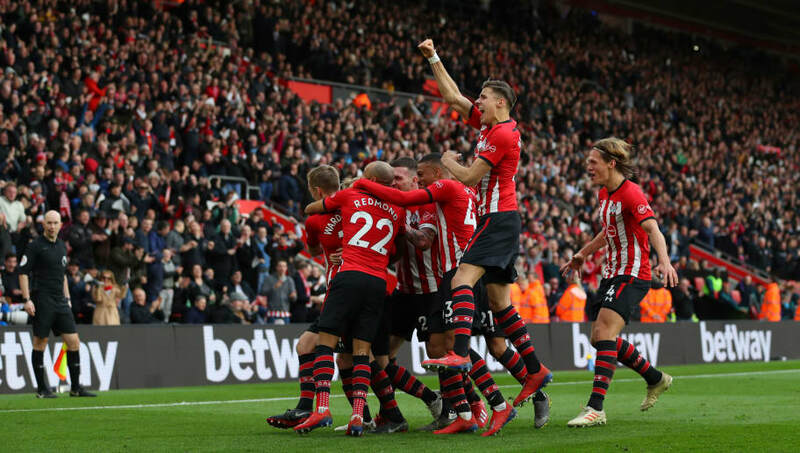 Southampton produced a stunning second-half comeback to beat Tottenham 2-1 at St. Mary's on Saturday afternoon, with Spurs now without a win in four Premier League outings. Despite Mauricio Pochettino's absence from the touchline - due to him receiving a two-game ban from the FA - Spurs dominated the first half. However, they were denied twice by the woodwork from taking the lead, with Maya Yoshida directing Harry Kane's cross onto the post on 21 minutes, before Christian Eriksen rattled the crossbar with a free-kick two minutes later. It mattered little for the visitors however as Kane got the breakthrough for the visitors on 26 minutes, as he latched onto a pass from a returning Dele Alli before calmly slotting home, although did appear to be marginally offside when receiving the ball. Southampton, however, were much improved in the second half, and found a route back into the game on 76 minutes through youngster Yan Valery, who converted Stuart Armstrong's cross at the far post. The Saints completed the turnaround on 81 minutes through a sumptuous James Ward-Prowse free-kick, with Spurs fortunate to avoid a red card after Kyle Walker-Peters clipped Armstrong to deny what appeared to be a clear goalscoring opportunity, while Moussa Sissoko avoided red for an apparent headbutt, although it mattered little as the hosts held on for a vital win. What a difference a half-time team talk can make, as Southampton were a much-improved team in the second half to the slow, limp display they produced in the opening 45 minutes. While the goals for the Saints didn't come until the end of the second period, there was more vigour and energy from Ralph Hasenhuttl's side, who are still in a battle to avoid relegation from the Premier League, with a moment of magic from Ward-Prowse deciding the contest. 3 points for Southampton. Ralph Hasenhuttl doesn’t deserve to go down. Ward Prowse, another game another beautiful free kick! Great manager. Changed a lot with Southampton. The win was Hasenhuttl's fourth at St. Mary's in eight Premier League games, and the Austrian will be relying on their home form in order to keep them in the division. Starting XI: Gunn (7); Yoshida (6), Bednarek (6), Vestergaard (6); Valery (7), Hojbjerg (6), Romeu (5), Bertrand (6); Ward-Prowse (8*), Austin (5), Redmond (7). Substitutes: Sims (7), Long (6), Armstrong (7). After producing a similar free-kick the game prior against Manchester United, James Ward-Prowse found himself on the winning side with an equally-magnificent set-piece against Spurs. It marked a quality performance from the midfielder, who has benefited greatly since the arrival of Hasenhuttl, and could find himself in Gareth Southgate's England squad due to his fine displays. After the high of reaching the quarter finals of the Champions League in midweek, Tottenham reverted back to their Premier League form, which has seen them to fail win any of their last four league games. Their performance in the first half however pointed to a routine win for Spurs, with Kane's strike midway through the half, although missed chances over the course of the game eventually caught up with Pochettino's side come full-time. Only see the second half of Southampton v Tottenham, due to catching up on sleep, but if I were colorblind I’d have thought Saints were in the quarterfinals of the Champions League and Spurs just over the drop. Genuinely don't care about top four just as long as we finish above arsenal. Instead of increasing their advantage in third, they've opened the door for Manchester United to go level on points with them, as the race to finish in the top four takes another unpredictable twist. Starting XI: Lloris (6); Walker-Peters (5), Sanchez (5), Vertonghen (6), Rose (5); Dier (6), Sissoko (6), Eriksen (6), Alli (7); Lucas Moura (6), Kane (7). Substitutes: Son (5), Davies (N/A), Llorente (N/A). One positive that Spurs can take from the game is the return of Dele Alli, who played his first game since January following a hamstring injury. The England star showed glimpses of why he's so highly-rated, especially in the first half, when he set up Kane for the game's opening goal, and will be an important player for them between now and May. Both sides don't play now until after the international break, as Southampton make the short trip to Brighton on March 30 in a game that could have major implications at the foot of the table. Tottenham meanwhile don't play until March 31 when they travel to Anfield to face Liverpool.